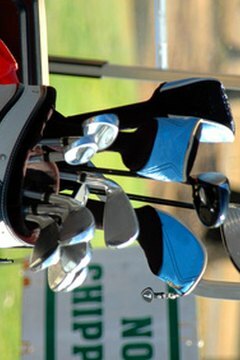 A complete set can contain several different types of golf clubs. A golfer is permitted to carry a maximum of 14 clubs onto the course, and it is advisable that if the physical burden is not too high, that players do so. The clubs each serve a distinct purpose, from the booming driver to short wedges and precise putter, with the player able to select any combination of clubs in his 14. The driver is the biggest club in the bag, both in clubhead size and the distance produced when a ball is struck well. With steep faces, between 7.5 and 13 degrees, the driver is commonly used off a tee, which holds the ball high off the ground. Talented golfers, however, can use the driver in the fairway under the right conditions. Fairway woods feature larger heads like the driver but are shallower, with a lower sweet spot, toward the bottom of the club. Fairway woods can be hit off the tee and off the ground when presented with a good lie, such as that on the fairway. The two most common woods are the 3-wood, with a loft of between 12 and 17 degrees, and the 5-wood, lofted 18 to 23 degrees. Irons were the traditional next step down from woods before hybrid clubs, and remain so in many players' bags. Irons have a comparatively thin face, allowing them to slice through thick lies, including rough and sand, and still put force on the ball. Irons are most commonly played off the ground; however, on many par-3s players will use irons off the tee. While irons range from 1 to 9, most sets range from the 3 iron to the 9 iron, which is lofted from 45 to 48 degrees. Hybrid clubs have begun to replace high woods and low irons in many bags. Hybrids seek to combine elements of woods and irons to make a club that is easier to hit cleanly, like a wood, but also has a shallower face to allow it to be played out of tighter lies, like an iron. A 1-hybrid, for example, can have a loft as low as 14 degrees, while a 5-hybrid can be lofted as high as 28 degrees. Wedges have heads similar to irons, however the faces are more open, meaning they point higher and send the ball a shorter distance at a greater height when struck. Wedges can be used to play high flops with backspin to cause a ball to stop quickly; or to back up on a hole where there is not a lot of green between the player and the hole; or played back in a stance as a running pitch shot that travels low toward the ground and rolls up to a hill when a lot of green is present. Wedges often fill specific rolls, like the high-arcing flop wedge or the bunker-specialized sand wedge. The putter is the most commonly played club, and will be used in a vast majority of all holes a golfer plays in her career. The putter features a flat face that provides minimal or no loft on the ball, and is used to roll the ball along the ground toward the hole. Putters come with various inserts to change the softness of the face, and different head and shaft shapes to change how the putter feels.